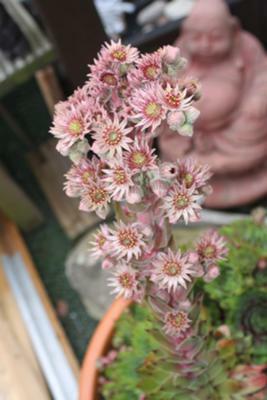 10ins tall with small pink flowers, as you can see from the picture. Hi Zed, what you have is a Sempervivum, the Hens and Chicks plant. Unfortunately, once they bloom, the rosette that the flower stalk originates from dies. Usually, they don't flower until after they have made some chicks to take their place. You can keep the flower stem after the flowers are pollinated by bees or other insects upside down in a paper bag and collect the seeds as they dry, and try growing your own hybrid Sempervivum from seed. 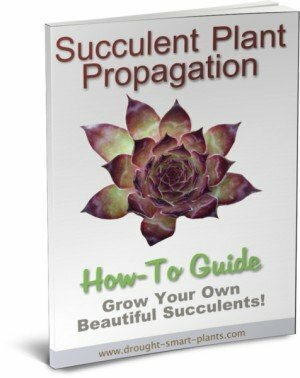 It's not difficult, and if you've ever had the urge to propagate your own succulents this is a good place to start. Hi Bob, no sorry, there is no way to tell which exact species or variety. These plants change so much over the course of the growing season, and are particularly difficult to identify when blooming. You can see what I mean in the Sempervivum Picture Gallery to see some of the ways they transform themselves. Scroll to the bottom of the page to see more.